The world’s attention, especially moviegoers and critics in recent years has been focused on the Cote d’Azur, where he conducted one of the most significant film events – Cannes Film Festival 2012, has been launched on the 65th time May 16, 2012. The program in 2012 – 22 films that do not quite entirely characteristic of Cannes. As noted by many experts, in 2012, as well as in the previous year, the nomination could get home as famous authors and newcomers. However, no less than the film the audience care about the red carpet – one of those places where the world community will be parading through a huge magnifying glass to look at the press. And rest assured, will be seen almost everything from make-up and finishing accessories. As for the clothes and jewelry, but this year especially you can select watches Jaeger LeCoultre- , who proudly flaunted on the march down the red carpet at the wrist of various celebrities. So, Diane Kruger, who by the way recently presented a new line of watches Rendez-Vous as a model walked down the red carpet with fine watches Jaeger-LeCoultre 101 Etrier on the wrist. Actress Julie Gayet from France preferred the classics: her red dress perfectly complemented the model of Jaeger-LeCoultre Reverso Ultra Thin in pink gold. 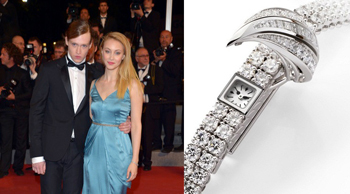 However, among others, stand out more than a young Canadian actress Sarah Gadon, who demonstrated a real dedication to hours of Jaeger-LeCoultre, wearing a watch brand as much as two times, combining them with different toilets. Fine Ladies Watch with Diamonds Jaeger-LeCoultre Calibre 101 Feuille actress wore a blue silk dress, emphasizing her gentle and romantic image. The second model are vintage watches Jaeger-LeCoultre Duoplan Vintage de 1950 in yellow gold, perfectly complement the red dress and an elegant look.